I finally put the second Harmony H-162 back together. I got two late 1960’s Harmony H-162 acoustic guitars about 2-3 years ago and it has taken forever to actually find the time to re-set the necks on them. The first one I put together back in November and that one was sold straight away. This one is reserved for a friend of mine but if he decides to get one of my Levin guitars instead then I will put it up for sale. They are really nice these Harmony guitars, wide neck, strong tone and great wood. Harmony used the same wood supplier as Martin back in the day. These were called folk guitars which is a grand concert size, the exact same size as a Martin 000. 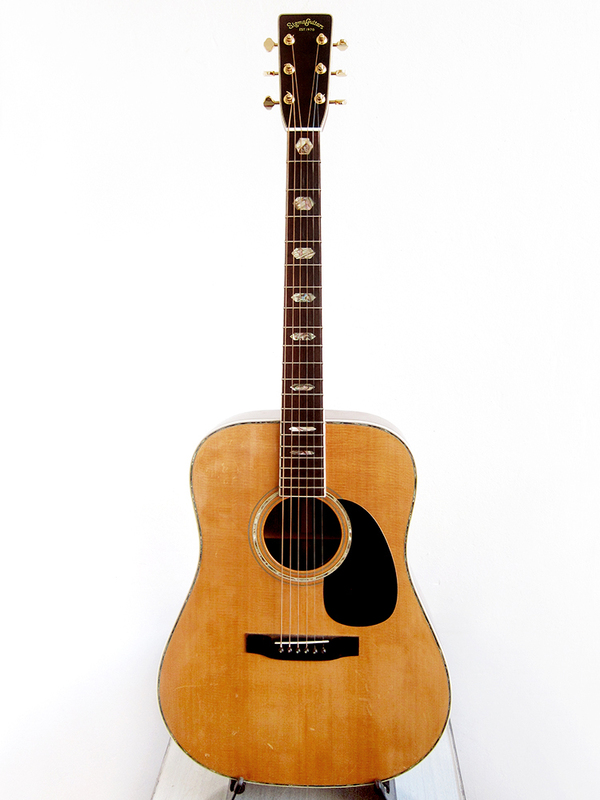 The Harmony H-162 was produced in Chicago from 1940-1971, this one is most likely from the late 1960’s looking at the headstock. 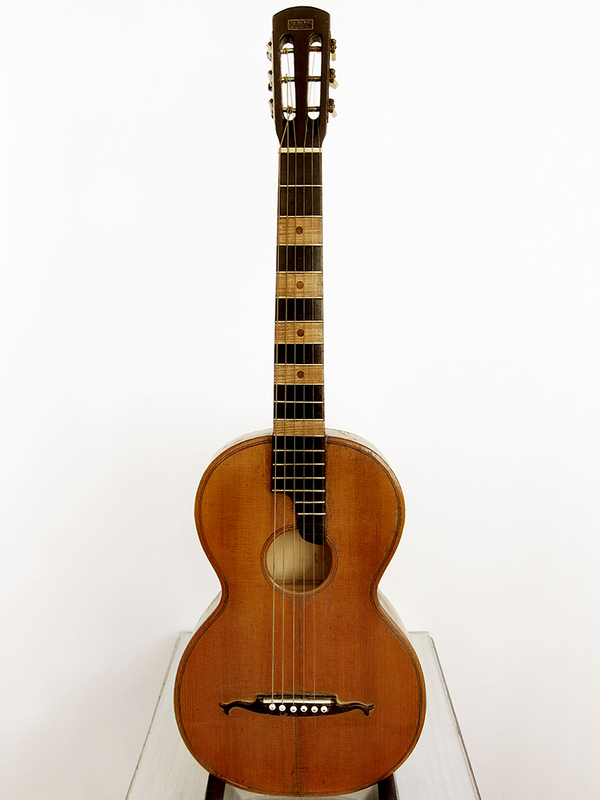 Even though it was an inexpensive guitar at the time they were built with all solid woods, back and sides of selected quality mahogany with a resonant spruce top. It’s a surprisingly well sounding guitar for being a mass produced ladder braced guitar, way better sounding than any Gibson B-15 or B-25 I’ve heard and it cost a third. The neck is pretty wide which makes it extremely comfortable for finger picking. Considering the price of a late 1960’s Martin 000-18, or even a Gibson B-25, the Harmony H-162 is a bargain for a USA made all solid wood vintage guitar. The Harmony H-162 was missing machine heads, nut and saddle so I cut new ones in bone and added machine heads and some ebony bridge pins. This is a project that could have been done in two days but has taken two years. I guess it’s partly my fault, I wasn’t really sure how to reset a neck so I kept putting it off. I also have a 1.5 years old daughter and she is like a black hole when it comes to making time disappear. Anyway, now it’s done and everything worked out pretty great. I steamed off the necks back in April and then I had a lot of gigs and moved house in the middle and then last week I finally managed to get the guitar back together. I drilled a small hole under the 14th fret and tried to steam it off that way but it worked really badly so in the end I got frustrated and just removed the fretboard and got the neck off that way instead. I glued the fretboard back straight away so I wouldn’t mix the parts between the two late 1960’s Harmony H-162 that I had lying around at home. 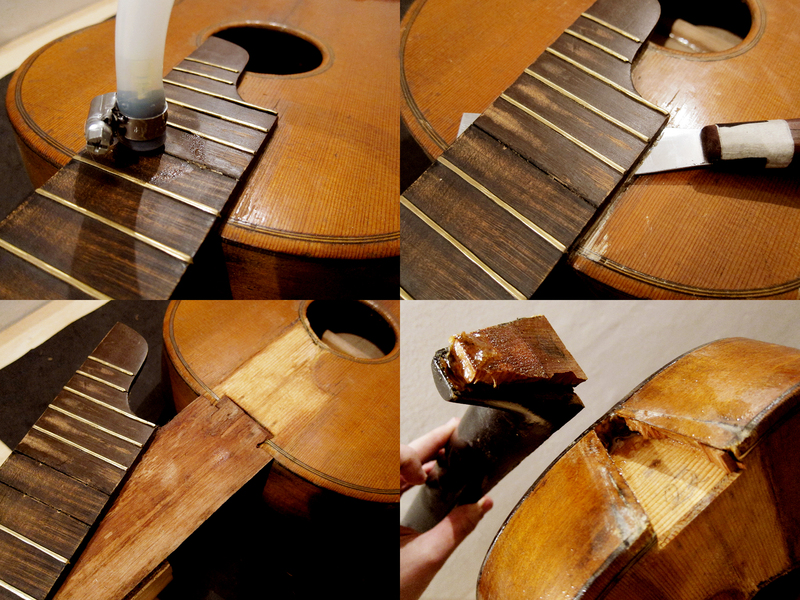 Once the neck angle was corrected I glued the neck back with Tite­bond 506/​4 classic wood glue. The late 1960’s Harmony H-162 in parts, it was actually quite easy to reset a neck. It’s pretty worn but the solid woods are really nice, mahogany back and sides with a two piece spruce top. I cleaned up the dovetail and heel with a chisel and then adjusted the neck angle with a file, it felt less risky than doing it with a chisel. I didn’t have to remove much for getting the action down and making it playable again. Last week I had Sr. Chinarro’s Rickenbacker 330 at home for some minor work. This was actually the first Rickenbacker guitar I’ve ever played, I tried a Rickenbacker 4003 Bass ones but that’s all. I’m not sure why I haven’t been more interested in the brand, they look amazing and a million awesome musicians plays Rickenbacker. Perhaps I got lured in to the Telecaster cave early on and never managed to find my way out. The Rickenbacker 330 was introduced in 1958 and it really feels like it was built in an old fashioned way, perhaps not entirely in a good way. I mean when the electric guitars came in the 1950’s all the different brands had to figure things out for themselves for not infringing anyone else’s previous patents, hence why saddles, pickups and constructions varied so much in the beginning. 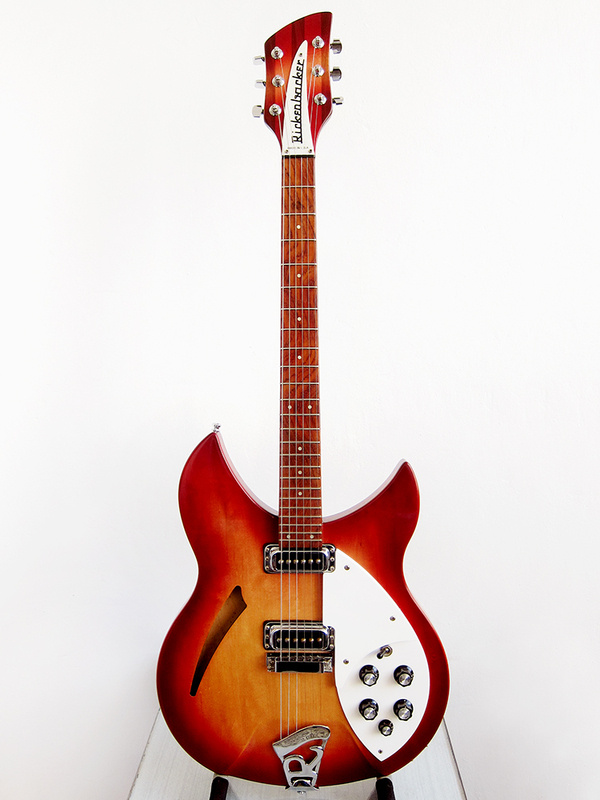 There are a few solutions on the Rickenbacker that feels a bit weird, like the saddle, pickguard or the fact that they have lacquer over the rosewood fretboard. The problem with this guitar was that it had groves in the fretboard that I had to fill in with lacquer, scrape and then buff out with sandpaper and metal polish, which worked really well in the end. I think I will stick to my Levin orchestra guitars when it comes to hollow bodies but I really enjoyed having this Rickenbacker 330 at home so I could finally try one out. I loved the neck, both thickness and the feel of it and the pickups sounds really great, it’s a very versatile guitar. Back in 2014 I built myself my first Claescaster, it was not just my first guitar but pretty much the first anything I ever built. It wasn’t great, but it wasn’t terrible either so I decided to give it second try and here is the result, the new Claescaster. The truth is that two years ago my wife was pregnant and I thought that was a great opportunity to build myself a Telecaster to mark the occasion. Unfortunately we lost that child half way through so I named the first guitar Greta after the daughter we never had. Two years later we tried again and were blessed with our little Frida, and just before she saw the light of day in early May I had my second Claescaster ready and gave it her name. My wife asked if I was going to build a guitar every time she gets pregnant and I might very well do that, it’s a great way for a man to keep himself busy during the nine long months of waiting. I will try to find some more pictures of the building progress, if not there are some more on my Instagram. Claescaster – Frida, is not the best Telecaster I’ve ever played but it’s still pretty damn good guitar, and ten times better than the first one I built. My plan was to build a 1952 copy so I could be like Bruce Springsteen, Keith Richards or Roy Buchanan with his Nancy. Unfortunately that never happened, or at least not as close as I hoped for. Everything was going great, I had an awesome baseball bat neck with a 7.25 radius, it was actually so fat that I had to reshape it twice, great grain running along the top, everything felt smooth and the edges were pretty straight for being cut and shaped by hand, then I got to the lacquer. I managed to use the wrong lacquer and even though I tried to scrape it off and try again I never got perfect after that. I decided to give up on the brand new look and went for some form of old and worn 50’s vibe instead, which was my secret plan all along, I just wanted to have it perfect before I made it look old. Anyway, I’ve learnt a lot for my next Claescaster. The body comes from a wood pile I found in the streets of Barcelona and most likely pine. If I remember correctly it was a beam or a bed frame, that I cut in half on the length and glued together to get the width. The neck was from a block of North American maple that I bought in a wood shop here and that I had to saw by hand, which took forever. I used a 6 mm stick of wood for the fretboard markers and jumbo frets from Jascar. The pickups are Artec and the hardware is all from Wilkinson. I will try to get video up so you can hear what it sounds like. As I mentioned before I ordered myself a LR Baggs Lyrics a couple of month ago and finally got around to install it in my Japanese Sigma DR-41 from 1980. I couldn’t really decide which guitar to put it in that’s why it took so long to get it done. The actually installation was very straight forward and easier than I expected. I just drilled a 13 mm hole in the end block, installed the endpin jack, stuck the microphone to the bridge plate inside the guitar and then just fitted the volume control at the sound hole and the battery pouch to the neck block. I did two tests to show the difference between my old LR Baggs M1 and this new LR Baggs Lyrics. I thought it would be a great idea to keep both systems in at the same time so the clips would be identical and easier to compare, but ended up getting quite a lot of noise. I’m not sure if it was a dodgy cable or if the systems interfered with each other, perhaps the magnets was causing havoc? Either way, neither sounds like this on their own. I played some nice chords in the first example and the normal things I play in my Youtube videos in the second, plus some little blues licks in the end. You can really hear the limitations of the M1, even though it has other advantages like the fact that it never feedback. I have a feeling that this Lyrics might be more sensitive for that on stage. I have to say that I really like to woody and open sound of the Lyrics and it seems to handle my attack as well when I play licks. Overall, the best and most natural sounding pickup system I’ve heard so far. I understand why Sturgill Simpson is using it. I’ve recently managed to do some more work to the Sonora parlour. I decided to reset the neck to try to get rid of the banana neck and high action and it worked pretty well. I also redesigned the fretboard and added some wooden dot markers. Now the action is low and the guitar is easy to play. 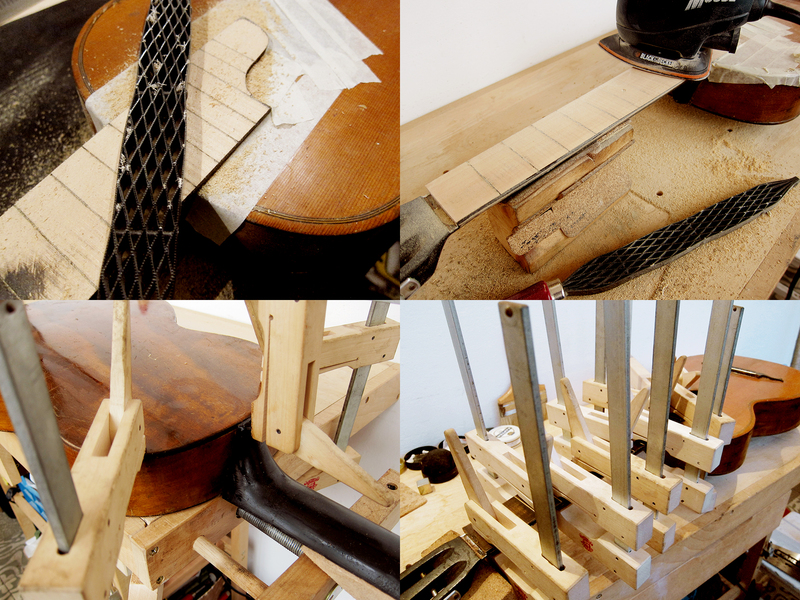 My initial plan was to steam the neck off by drilling two small holes under the 13th fret and that way get steam straight in to the dove tail. That didn’t work, I think it was too much old glue stuck in the joint and also the needle tip I used for my home built steamer was too thin. I decided to remove the whole fretboard instead, I used a spatula heated on a normal clothes iron which worked like a charm. Once the fretboard was off I could just steam the hell out of that joint and eventually the glue softened and then neck came off. Next I had to try to remove the hump on the fretboard where the neck and body meet. 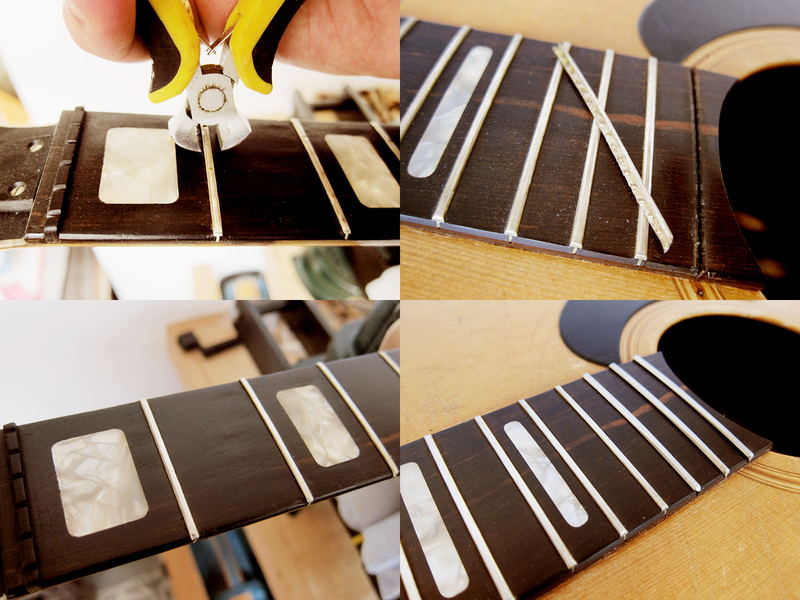 I removed all the frets, and kept them in the correct order to make it easier to reinstall them later. 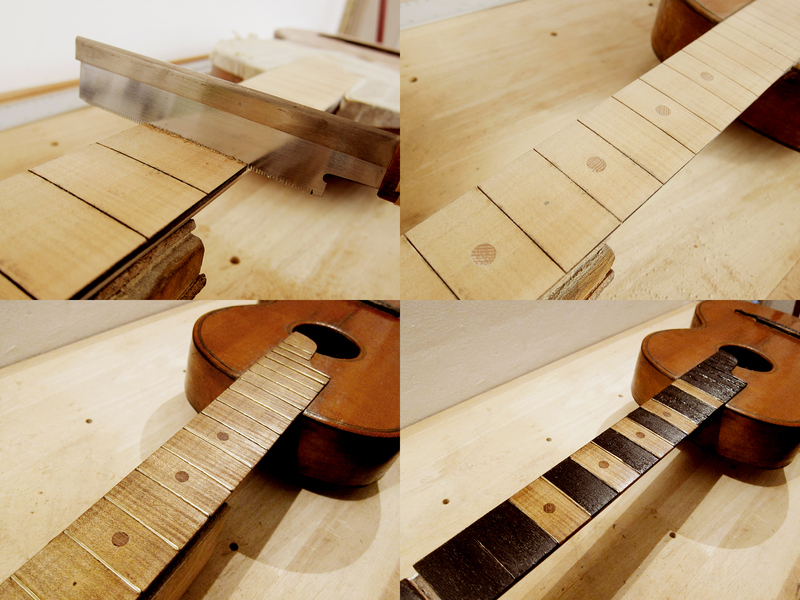 To get rid of the hump I had to remove almost 6 mm of the overhang and then sand the rest to get the fretboard straight. 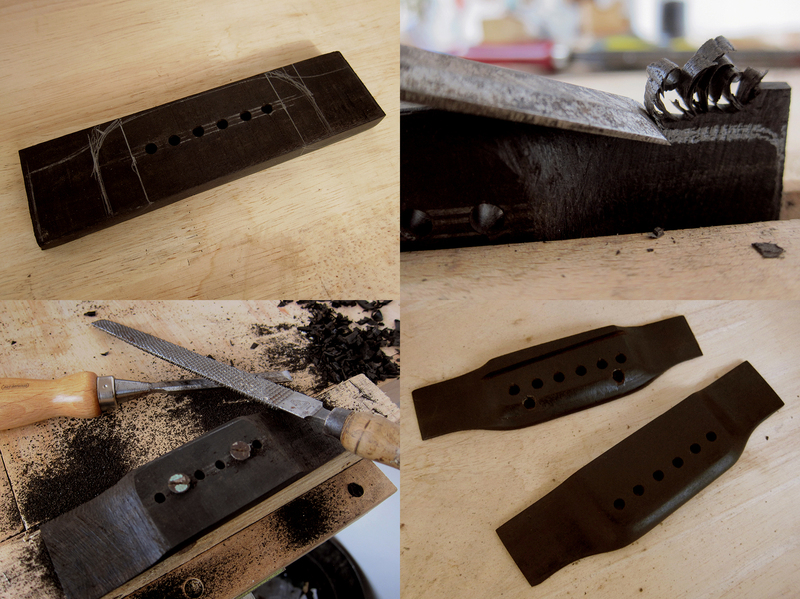 I re-cut all the fret slots, reinstalled the frets and added four wooden dots in different grain directions as position markers. I gave the fretboard a coat of lacquer and then painted everything black except for the 3rd, 5th, 7th, 9th and 12th fret. I added a layer of lacquer on top and then sanded it smooth and polished out the frets again.